Every Chimney Needs a Cap. Many chimney caps include 18 gauge wire mesh to reduce the amount of sparks and large ash that normally blows into the air and onto rooftops. Where the standard chimney cap does not fit the chimney or isn’t appropriate, American Chimney and Masonry has the expertise to recommend and install the appropriate chimney cap for any chimney or vent. 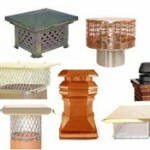 Special caps (for large or unusual sizes), copper caps, wind directional and draft inducing caps and UL Listed caps for manufactured fireplaces are all available from our trained staff. We even can install damper caps that help prevent heat loss and will reduce your heating bills!